The Costa Brava Landfill is promoted as a temporary solution to the trash crisis that Lebanon suffered of in 2015. However, local residents and activists are against this landfill because it has many impacts on the environment and the aviation safety. The Costa Brava landfill was opened in April 2016, it is one of the two landfills that have been advertised by the Lebanese government as a solution to the eight-month trash crisis that the country went through in 2015. It was a temporary alternative to the Naameh landfill which was closed in May 19, 2015, after 17 years of operation, leading to the accumulation of trash piles in the city of Beirut and its environs. However, two weeks after the establishment of the plan, local residents and activists including the “You stink” campaign, the campaign for the closure of Al-Ghadeer landfill and the Lebanese Eco Movement held protests at the sites requesting the closure of the Costa Brava and the Bourj Hammoud landfills. 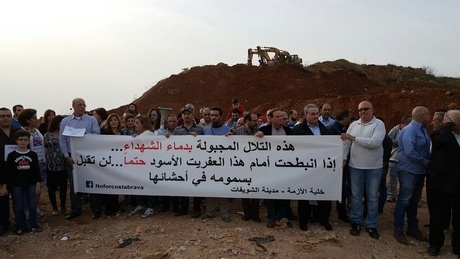 In September 2016, activists filed a lawsuit against the Lebanese State, Al-Jihad group for Commerce and Contracting (JCC) and the Union of the Southern Beirut municipalities asking for the closure of the landfill. In addition, residents and activists from the Lebanese Eco Movement created a tent at the site preventing garbage trucks from penetrating and disposing the waste. In their sit-in, they requested people to sign a petition to the United Nations Environment Program (UNEP) to shut the landfill since it could contribute to the pollution of the air and the sea nearby and it could be a threat for aviation safety due to its location close to the airport. The petition got 10,452 signatures; however, Paul Abi Rached, president of the Lebanese Eco Movement and TERRE Liban, stated that it was not useful because UNEP seemed to support the emergency plan. Additionally, many activists declared that the installation of the landfill in the chosen site is a violation of the Barcelona convention concerning the Protection of the Marine Environment of the Mediterranean that was adopted in 1995. 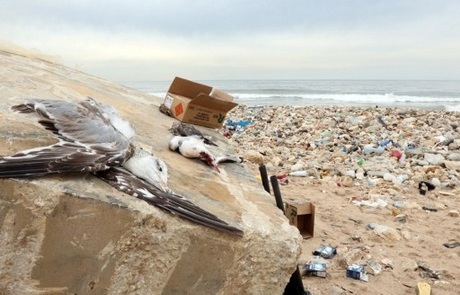 Following this mobilization, the Judge of Urgent Matters in Baabda, Hasan Hamdan, ordered in December 2016 the Civil Aviation Authority, the Ministry of Environment and the Ministry of Agriculture to conduct a study assessing the impacts of the landfill on the environment and the aviation safety. On January 10, 2017, an airplane faced a large flock of birds, namely seagulls, at departure. On the following day, Judge Hasan Hamdan sanctioned the short-term closure of the Costa Brava landfill after the Transportation Minister Youssef Finianos called the situation an emergency. Regarding this issue, Member of Parliament Walid Jumblatt also tweeted:” Regardless of what the price was, the waste dump should be kept away from Beirut’s airport so that a disaster doesn’t occur as yesterday” . Moreover, as a response to the incident, Prime Minister Saad Al-Hariri called for equipping the Rafic El- Hariri International Airport with ultrasonic bird repellents. Additional temporary solutions constituted of employing experts to kill seagulls, diverting flights to other runways, and putting in field patrols at the runway 16 to guarantee safety. After the judicial decision, the contractor responsible for waste management in Beirut southern environs and Baabda stopped the waste collection activities. Fearing that garbage would once again pile-up in the streets of Beirut and its suburbs, Judge Hasan Hamdan ruled to reopen the Costa Brava Landfill for a period of one week, on January 16. The judge gave a period of four months until the permanent closure of the landfill, thus giving time for the municipalities to find replacements for the dump site. However, in February, Beirut Southern Suburbs municipalities Union appealed the judge’s decision considering that the landfill should not be closed until an alternative is found. Mohamad Dergham, head of the municipalities union, said: “Our demand is to find a permanent alternative for the Costa Brava site and not to have trash piling up in the streets”. 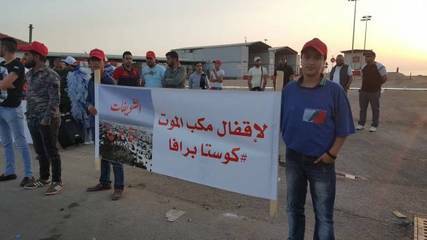 On April 21, 2017, the Choueifat Municipality insisted that the Council for Development and Reconstruction (CDR) mobilizes against this crisis before the temperature starts rising in the summer. Choueifat Mayor Jihad Haidar stated: “This situation has been getting worse over the past week”. Protestors also blocked the entry to the Costa Brava landfill and organized a rally to increase people’s awareness about the landfill’s impact on the environment. On June 13, 2017, while inspecting the Bourj Hammoud Landfill, Tarek Al-Khatib, the Lebanese Minister of Environment, indicated that dumping the waste in the sea is a crucial part of the trash plan. It is important to note that his statement also applies to Costa Brava Landfill since it is located near the coast and is a part of the temporary plan. Project Details The project of the Costa Brava Landfill was a part of an emergency plan approved by the Cabinet of Former Prime Minister Tammam Salam in 2016, in order to solve the trash crisis that Lebanon suffered of in 2015. Trash piled up in the streets of the city of Beirut and its suburbs as a result of the closure of the Naameh Landfill in July, after 17 years of operation, with no substitutes provided. The four year plan constituted of reopening the Naameh Landfill for two months while establishing two new landfills; one in Bourj Hammoud in the North of Beirut and another one in Costa Brava located nearby the South of Beirut. 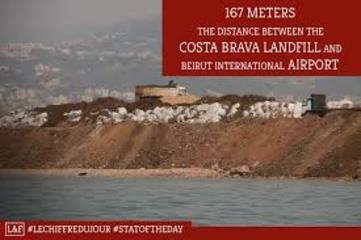 The Costa Brava landfill (Khaldeh) is situated at 167 meters (0.1 miles) away from Rafik El- Hariri International Airport. It is located near the shore where a beach resort is present. The Landfill is designed to receive approximately 1.5 million tons of waste from Beirut and its suburbs (e.g. Baabda). The Ministry of Environment based its selection of the Costa Brava site to paragraphs 2-3 of Cabinet Decision No. 1 of 12/1/2015, namely that “the final disposal of the waste resulting from its treatment should be achieved by rehabilitating degraded sites, and/or random dump sites and/ or any other sites in need of rehabilitation”. Moreover, a consultant of the former Minister of Agriculture, Sawsan Bou Fakhreddine declared that “the decision to open landfills there was based on the theory that these areas (Bourj Hammoud and Choueifat) are already polluted” . The main rules of the plan consist of the recovery of 60 percent of the waste through sorting, recycling, reclamation and recovery of energy during the first three years of commitment, with the increase to 75 percent in subsequent years, leading to thermal disintegration. Accordingly, before dumping the waste into the landfill, the waste is supposed to be sorted at the Amroussieh sorting facility. However, activity started by temporarily open dumping the waste while the area is being transformed into a sanitary landfill; therefore, the waste is not being sorted. As a compensation for the acceptance of the waste, the municipalities affected by the landfills are to be given $8 million a year. Activists and officials that opposed the project stated that it will lead to air and water pollution as well as endanger the aviation safety since it is very close to the airport. In January 10, 2017, a plane faced a large group of birds which caused an accident during take-off to happen. As a response, the judge of urgent matter Hasan Hamdan decided to close the landfill temporarily until an alternative is found. However, the landfill was reopened and it is still operating until now. Development of Alternatives T.E.R.R.E non-governmental organization proposed an alternative plan for the management of the waste of Beirut and Mount Lebanon for one year. The project which is entitled “National Action plan for Waste Recycling and Sorting” promotes the protection of the environment, can be easily implemented and is cost effective. According to Paul Abi Rached, founder and president of the organization, the NAWRAS transitional plan is Eco friendly and it can provide around $50 million for the government. The project consists of the mandatory sorting and separation of waste into organic, inorganic and hazardous material at the level of households, establishments, stores, restaurants, etc. by installing green and red garbage bins in the streets for the disposal of the separated waste. The waste is then collected by garbage trucks and transported to several facilities. Generally, the organic waste is carried to a composting plant, the inorganic waste is recycled and the hazardous waste is stored. Thus, the main purpose of the plan is to reduce the amount of waste dumped into the temporary landfills, including the one in Costa Brava, from 2400 tons/day to 300 tons/day. Why? Explain briefly. According to Hassan Bazzi, the attorney who issued the lawsuit, the judge’s decision of closing the landfill after four months was appealed by Beirut Southern Suburbs municipalities Union. However, this decision can still be implemented since the court of appeal of Mount Lebanon did not come up with any judgement after the appeal. Nevertheless, Paul Abi Rached indicated that politicians and government actors are trying to postpone the court date by applying pressure on Judge Hasan Hamdan in order to change his decision of permanently closing the landfill. In his opinion, these people are trying hard to keep residents away from the site because, later on, it would be beneficial for the establishment of other projects. As expected, on June 22, 2017, the court of appeal date was postponed until 6/7/2017 because the representative of the Council for Development and Reconstruction (CDR) requested concerned individuals to listen to the Socotel consultant.